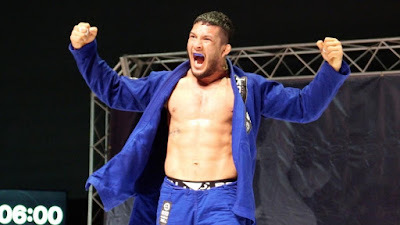 Lucas Barbosa, better known as the 'Hulk', promises to make his mark at the Abu Dhabi Grand Slam Tokyo on July 15. The Grand Slam in Tokyo is an event with a lot on the line, but Barbosa said that he isn't focused on fighting for the top spot in the UAEJJF ranking -- at least, not yet. Sure, he plans to compete in the various events around the world that will earn him ranking points, but the black belt's goal is to win the prize money and gain experience. “In fact, I don't intend to lead the ranking, it's not my goal. But I want to compete because Grand Slam is a championship with good prize money, and this gives a lot of incentive to the athletes, especially at black belt”. Hulk has plenary of experience fighting under UAEJJF rules, in which matches are only six minutes. He won the Abu Dhabi World Pro absolute division while still a brown belt, but missed the 2016 World Pro as a black belt due to his visa situation. He made his return in April at the 2017 World Pro and learned the hard way that the rule changes implemented since he last fought had made the game very different. With aggressive penalties against stalling, Hulk was disqualified during the country qualifier round. The plan is now to enter more UAEJJF competitions she he can acquire more experience and adapt to the different rules. "I intend to fight in many Grand Slams. I like the six-minute matches, 10 minutes is a long time," he says. "In six minutes, the athletes need to get after it and keep moving, its way better. You can see the match going forward on both sides. You can't hang around; it's such a quick match." Barbosa is in at 85kg, alongside Isaque Bahiense of Alliance, Marcos Paulo of DDR Jiu-Jitsu and Jaime Canuto of GF Team. The Atos black belt picked up a nice medal haul last week in Las Vegas, the result of the hard work he puts in on the mats in San Diego alongside Andre Galvao, Keenan Cornelius, Josh Hinger and the rest of the team. "Training is as per usual, training both gi and no-gi, all the same. I'm trying to keep on top of training and competition, I just won the American Nationals and I think as I've been fighting a lot it helps for any upcoming championships. “I hope it works out. There are various tough athletes and it won't be easy. The 85kg division is one of the best and most competitive in the world -no easy matches. But I'm ready, I'll go there to give my best and go home with the Grand Slam title”.